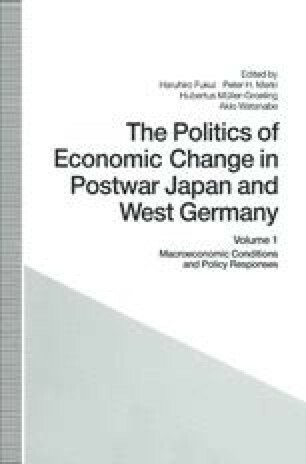 Both the Japanese and West German economies have experienced long periods of rapid growth since World War II. Until the first oil crisis of 1973, the average growth rates of 10 per cent in Japan and 4.5 per cent in West Germany had created the impression that their economic expansion was unlimited, although both had also experienced occasional mild recessions. Following the 1973 oil crisis, however, their growth rates fell to −1.2 per cent in Japan in 1974 and to −1.8 per cent in West Germany in 1975. Subsequently, these rates recovered to 4.7 per cent in Japan and 3.6 per cent in Germany later in the decade, but with declining trends in both cases.